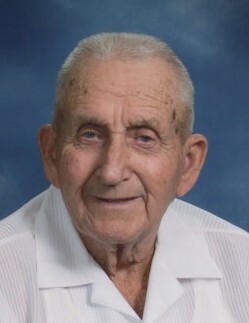 Wayne Rankin, 96, of Bowen, IL died at 11:48 am Thursday September 27, 2018 at Sunset Home in Quincy, IL. He was born on September 4, 1922 in Table Grove, IL to Delmar Boyer and Dorothy Ellen Schaeffer Rankin. He married Dorothy M. Peterson on November 6, 1940 in Palmyra, MO. She preceded him in death on June 22, 2002. Wayne was a retired lifetime farmer in the Bowen area. He attended schools in Schuyler and McDonough counties. He was an active member of the Bowen Christian Church and enjoyed fishing and hunting and remained active in those sports well into his nineties. He was also an active community member and former member and president of the Bowen Lions Club helping in the building of the original Bowen swimming pool which he managed along with his wife Dorothy for several years. He is survived by a daughter, Judy (Roger) Reuschel of Bowen, IL, a son, Dennis (Carol) Rankin of Quincy, IL, a daughter-in-law, Roxanne Rankin of Bowen, IL, 11 grandchildren, Kevin (Kari) Reuschel of Bowen, IL, David Rankin of Peoria, IL, Gayle (Kevin) Gottman and Amy (Mark) Evers of Quincy, IL, Kristin (Curt) Shaffer of Ursa, IL, Jared (Heather) Rankin of Carthage, IL, Amanda Rankin (James Kling) of Elgin, IL, Melissa (Marc) Banks of Urbana, IL, Tracy Rankin (Scott Randle) of Rock Hills, MO, Douglas Reuschel of Houston, TX and Aaron Rankin of Conway, SC; 16 great grandchildren; and a cousin, Bernard French of Astoria, IL who was raised as a brother to Wayne in the Rankin home. He was preceded in death by a son, Terry Rankin, a daughter-in-law, Velma Rankin and a brother, Eldon Rankin. Funeral services will be held at 10:00 am Tuesday October 2, 2018 at the Bowen Christian Church in Bowen, IL. with Rev. Tom Mehaffy officiating. Burial will follow at the Bowen cemetery. Visitation will be held from 5:00 to 7:00 Monday at the Bowen Christian Church. Memorials may be made to the Bowen Christian Church.